The Laurence A. Baiada Institute has announced the winners of its 2012 Incubator Competition. First place goes to Nooch, Inc., a mobile application for smartphones that enables users to send money person-to-person. 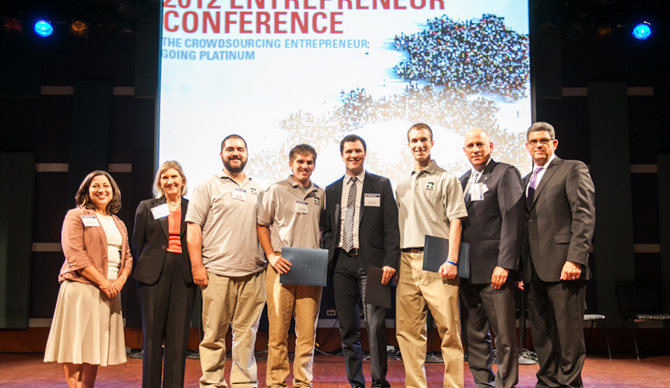 Nooch’s founders are LeBow alumnus Tom Peduto ’11, College of Engineering student Dan Shick, and Cliff Canan and Nate Wineland. In second place is Quotovation, Inc., which provides a web service that connects homeowners looking to have work done on their homes with contractors willing to quote the jobs. Quotovation’s founders are LeBow alumnus Michael Englisch ’08 and School of Biomedical Engineering, Science and Health Systems alumnus Ali Okur ’07. A startup called Great Spaces placed third. Great Spaces is an online community connecting people with spaces to rent for events and social gatherings. This startup was founded by College of Information, Science and Technology alumnus Abhishek Kuril ’04, College of Arts & Sciences student Sunkwon Bush, and Katharine Livingston. Six finalists competed for these three top spots. The winners share $75,000 worth of cash prizes to defer the cost of Baiada Center space and training, and in-kind prizes from several organizations including strategy consultants ACM Advisors; communications and marketing consulting firms Hunter, ThreeZero Communications and Communications Services and Support, and law firms Eckert Seamans Chrein & Mellon, Dougherty Law Offices and Weber Law. For the first time, in-kind prizes were awarded to a company that did not place in the top three. Sustainable Environmental Solutions International LLC, founded by LeBow MBA alumna Megan Brown ’07, won this honorable recognition. The theme of this year’s conference, held June 6 at World Café Live, was Crowdsourcing: Going Platinum.